Old jeans on the bottom left, new jeans below. I’ve finally bought my first pair of long bottoms since starting my weight loss programme. I was at Uniqlo Vivocity and was looking for a 32″er in the main section for jeans. This based on that last pair of Bermudas that I bought a week or so ago. Along the way to the main section for jeans, I spotted a somewhat messy bin full of light blue jeans – my preferred colour. I checked the stocks but they were only available in 31″ size. I picked one to try anyway. The main jeans section was filled with jeans… but tellingly (since much of it was on sale, I must be late), there was little choice for size 32. Most size 32″ers were out of stock and the ones that remain were too dark for my taste. I picked one anyway just to test the fit. 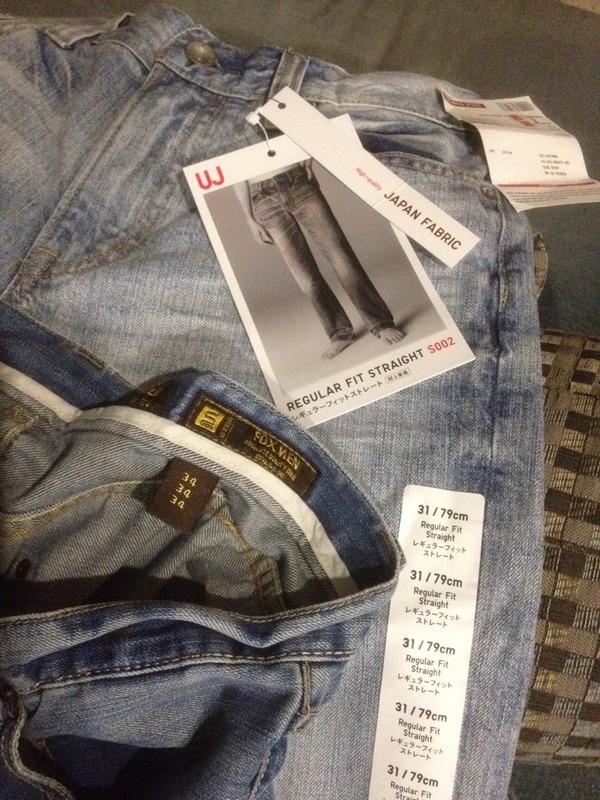 In the fitting room the dark blue 32″ jeans looked awful. Even the fit wasn’t right. I tried the light blue 31″er….. And was surprised it fit very snugly! I could hardly believe it. It was a very snug fit for me, for the record, but that’s fine for jeans since they will expand. I can’t even remember if I have ever fit into a 31″ in all my life! I must confess now I truly understand that one of the greatest rewards of losing weight is the thrill of having and seeing clothes actually fit nicely (again, or for me, practically the first time). And while you already know this, reaping the reward is another thing all together. In the past, even if I picked, say, a shirt that fits my shoulder width, my paunch would make sure my “equator” looked…. well, equator-ish. I used to wear 16″ (collar size) shirts for the simple fact that any smaller and my stomach would show. I needed something bigger to give my stomach some…. “breathing space”. But wearing a 16″ meant that the sleeves tended to be too long, as would the hem. And the shirt tended to look a little big. You know what I mean when you look at people in the “slim fit” category – their clothes look incredibly small. On the same day I bought the jeans above, I also picked two short-sleeved shirts from G2000. I’ve always bought more formal wear from G2000 as their cutting fits me. I’ve not bought formal shirts from any other brand for many years. In the past I wore 16″ shirts. But when I tried on a 16″ the other day, it felt just a little roomier than I imagined. So, I tried on a 15.5″…. and it was a snug fit, the sort that I’ve never ever fit into before. I actually looked good.